In the early years we get so much art and craft pieces come home from school and kindy. 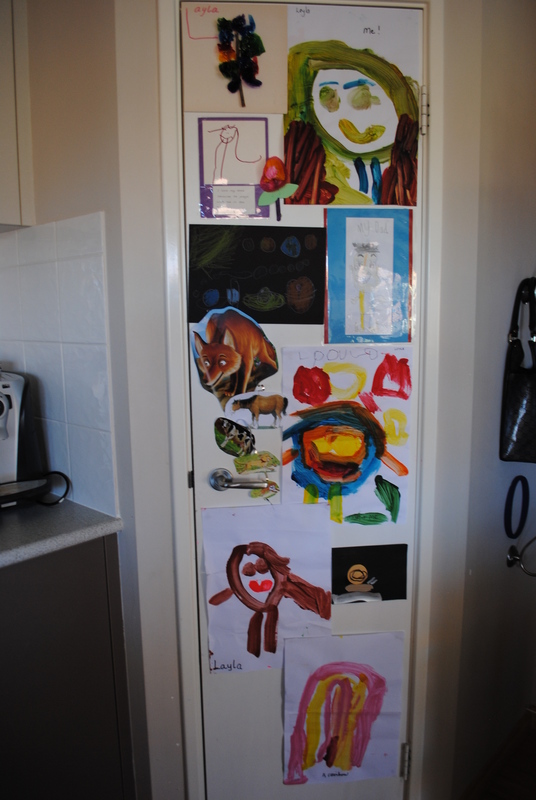 My kids are so proud of their work that we were finding that our fridge was over crowded with endless amounts of paintings and collage. Every time we opened the fridge things were falling off and paintings were getting ripped. So the teacher in me, started to display them like I would in a classroom but instead of using my fridge I use my pantry door. It’s a great place for all to see and when new pieces come home I take the old ones down. I use blutak to display them and as the door is painted in a gloss it doesn’t remove the paint. The kids love it and so do I! Another way I display their ‘special’ artwork like the art piece that got chosen for the school art expo or their first drawing of themselves. I frame them and display them in their playroom. My kids are really lucky to have a play room. It’s nicely tucked away from the rest of the house and actually sits in between Layla and Oscar bedrooms. 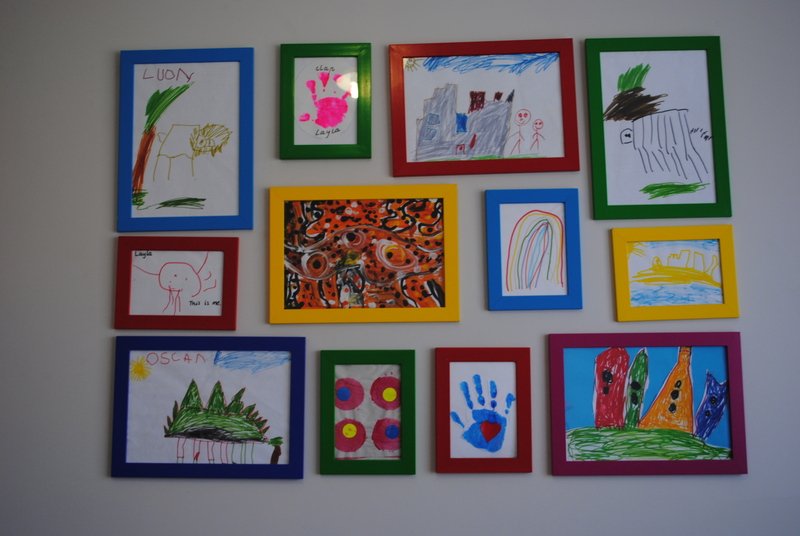 So I decided a really simple way to add some fun to the walls was to display their artwork. I found these great colourful frames at Ikea they were perfect, the frames came in all different colours and sizes. We decided that we were going to let this wall grow as the children do, so that way we have a collection of drawings and paintings over different years and stages of their life. Generally I choose what goes into the frame but I do allow them to choose a favourite too. I have found some other ways people display their children’s art on Pintrest follow this link and I have created a board called ‘Display Kids Art’ on there is a collect of photos and ideas!